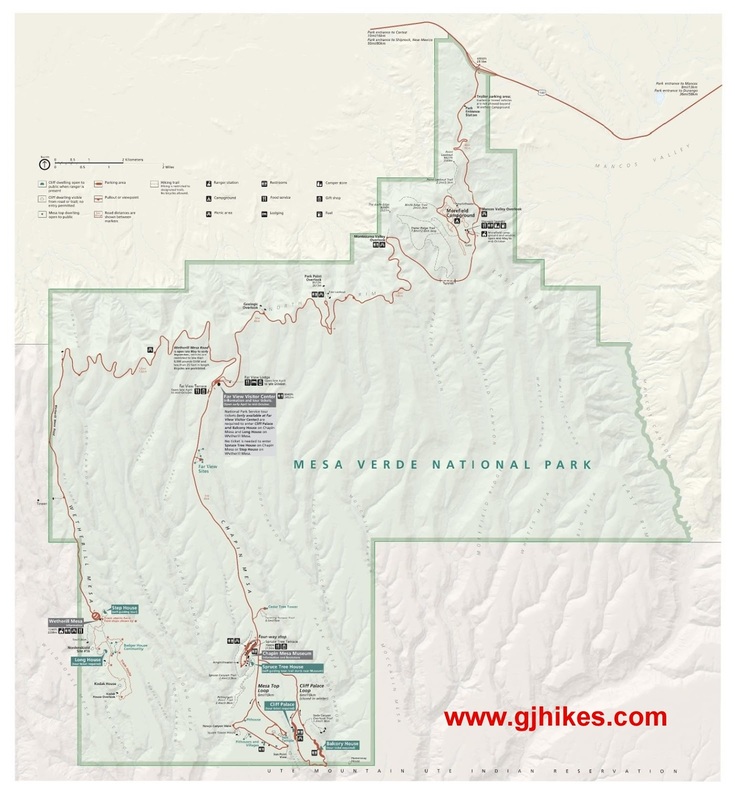 The Prater Ridge trail is in the Mesa Verde National Park near Cortez, Colorado. The trail climbs from the Morefield Campground to Prater Ridge where it follows around the rim completing one big loop. The hike can be broken down into 2 smaller loops, a north loop and a south loop, by making use of a connector trail. Prater Ridge separates Morefield Canyon and Prater Canyon and offers commanding views of the Montezuma Valley. The Prater Ridge trailhead is on the southwest side of the Morefield Campground. While there are no toilets at the trailhead itself there are flush toilets in the campgrounds and at the Morefield Village where you will also find a general store, gift shop, cafe, gas station and free showers for registered campers. The trail travels west from the trailhead and passes just above the group camping sites. A short connector trail breaks off to the right that leads over to the Knife Edge trail. If you look closely at the picture, or click on it, you will see several deer on the connector trail. Deer are common in the Morefield Campground area during the period from dusk to dawn. Occasionally black bears and turkeys are also spotted in the area. Most of the elevation gain is within the first mile of the trail. The trail picks up 500 feet as it climbs steadily to the top of the ridge. A gain of 500 feet over the course of a mile isn't too bad for those that are accustomed to hiking in Colorado but it will probably seem fairly strenuous for others. Usually, when it comes to hiking up mountains, the view from the top is worth the effort. When the hike commenced the mountains of Lone Dome and Point Lookout seemed to tower high above the campground. As you near the ridge summit you are able to look out over the tops of them. The loops begin once you reach the top of the ridge which is just over a mile from the trailhead. 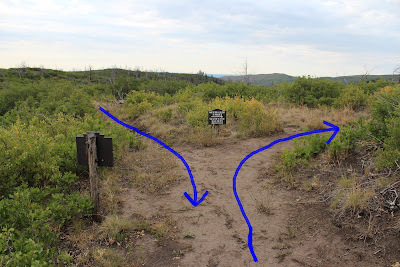 This post follows the trail to the right and completes one big loop around the ridge. The connector trail is a short distance down the trail to the left. A shorter and less strenuous hike would be to follow the trail to the left and hike only the south loop. The north loop is just over 4 miles by itself and the south loop is just over 2 miles. The north loop has about another 200 feet of elevation gain while the south loop only has minor changes in elevation. Continuing along the right fork the climbing begins almost immediately. It is interesting to note that the area had received considerable amounts of rain the night before but the trail was barely damp. The water runs off quickly on steeper slopes before it can soak in and make much mud. The flatter areas of the trail are mostly sandstone which also easily shed the water. After climbing to the high point of the ridge the trail descends back down to the rim and begins following it around the ridge above Prater Canyon. From this point on the hiking is incredibly pleasant with great views of the surrounding area. The white cliffs of Mesa Verde are laid out to the west with Ute Mountain rising up in the background. The section of the trail that follows the rim of the canyon is the longest part of the hike and also the easiest. If it wasn't for the effort that it takes to get up to the ridge the level of difficulty would be more on the moderate end of the scale. After hiking around to the side of the ridge opposite of the campground you come to the west end of the connector trail. 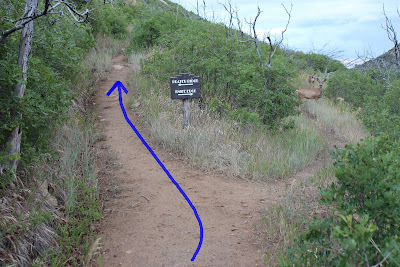 A person could cut a couple of miles off of the hike by following the connector over the top of the ridge which would complete the north loop. Continuing on along the south loop the trail stays near the edge of the ridge. There are several canyons that cut into the ridge that the trail follows inward to the head of the canyon and then back out on the other side. The highway that provides access into Mesa Verde passes through a tunnel in the south end of the ridge. The trail turns back to the north just before getting over the tunnel. Back on the east side of Prater Ridge the view is once more down into Morefield Canyon. The east end of the connector trail comes up just before finishing the loop. While hiking back down the ridge the layout of the campground can be easily studied. Camping at Morefield can be a little more expensive than at some national parks, running about $20/night, but it does include free showers, coin operated laundry and internet access at the general store. The campground is open from mid May to mid October and is closed for the remaining months but so are most of the cliff dwellings. 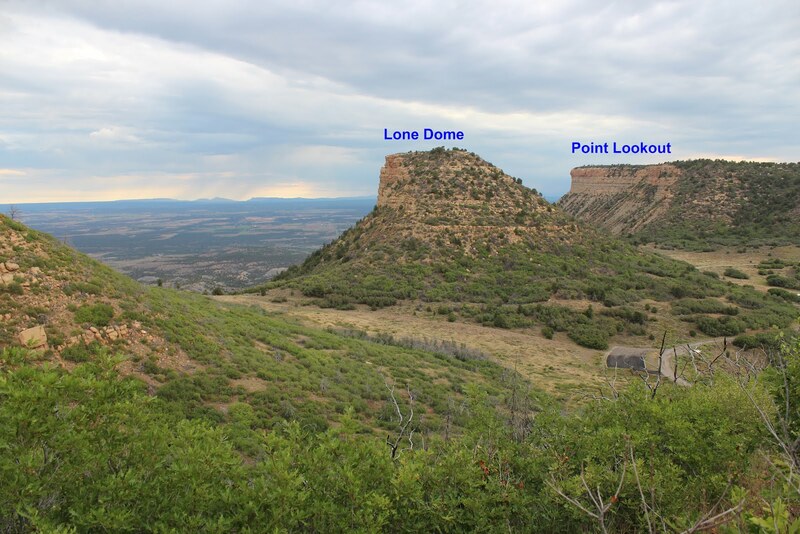 About the only sites to see during the winter months are the Far View Group of ruins and the Spruce Tree House at Chapin Mesa. Prater Ridge is a great hike for anyone who is staying in the campground and that might be missing out on their normal exercise from a daily trip to the gym. Even though the Prater Ridge trail is in the Mesa Verde National Park there aren't any apparent Indian ruins to see. While the ridge may have provided a good lookout point or place to hunt there doesn't seem to have ever been any structures built on it. The ridge would also not be somewhere you would want to hangout during a thunderstorm. Mesa Verde does seem to get more than its share of lightening strikes that reach the ground. If you would like to see it for yourself then all you have to do is 'Take a hike'.